Flooding was the main cause of $17 billion in global natural catastrophe during the first half of the year, says Swiss Re. According to sigma estimates from Swiss Re, says the insurance industry absorbed $20 billion of the first half’s natural and man-made catastrophes. The total is about 35.7 percent of the total $56 billion in economic losses from the same disasters during the first six months of 2013. Last year economic losses from first-half catastrophes were $67 million. Flooding primarily in Europe, Canada and Australia caused $8 billion of the total $17 billion in insured losses from natural catastrophes. 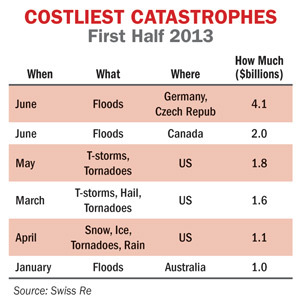 Swiss Re says 2013 is already the second costliest year for insured flood losses on sigma records. Floods in Germany and the Czech Republic caused $18 billion in economic losses but only $4.1 billion was insured. May tornadoes in the U.S., especially the Moore, Okla. twister, generated $1.8 billion in claims.